Jakalier is the name of a Mobile Assault Vehicle. 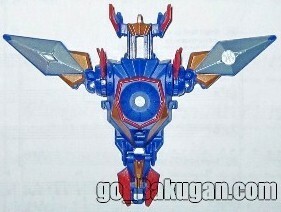 It is a Wave 4 Bakugan Mobile Assult vehicle, and was released alongside Impalaton. It's move on Bakugan Dimensions is Mach Speed. It moves the bakugan into close range. The prototype was revealed at Toy Fair 2010. It has been seen in Pyrus, Ventus, Aquos, Haos, and Darkus. Pyrus has 230 Gs, and Haos and Ventus both have 220 Gs. Purchase Jakalier Bakugan from Amazon now!